To start, I created the tear-drop shape's portion by coiling the base with fine silver color's copper wires, then added some matching color's Swarovski purple crystals to fill the shape and then a freshwater pearl for finishing. The focal was composed by coiling a 2cm diameter keychain with fine silver color's copper wires as well, I added few 2mm silver color beads to it's outer part to create extra sparkling effect. The lower-center featuring a 12mm purple Zircon round. 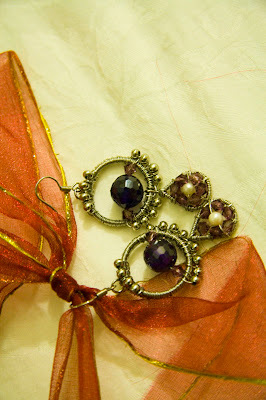 The earrings focal measures 1.6" from the bottom of the ear-wire. The upper right earring in last image shows the view of the earring from behind.